Scenario & Procedure: Scenario: Sitting in your bedroom typing an email on cell phone, you hear the sounds of a home invasion from outside your bedroom. Defend yourself and your family. 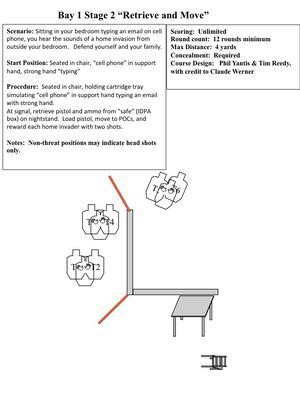 Start Position: Seated in chair, “cell phone” in support hand, strong hand “typing” Procedure: Seated in chair, holding cartridge tray simulating “cell phone” in support hand typing an email with strong hand. At signal, retrieve pistol and ammo from “safe” (IDPA box) on nightstand. Load pistol, move to POCs, and reward each home invader with two shots.